Anyways, a while ago I was doing this weekly thing I called Friday confessions. Basically I just confess anything I feel like it and you get to judge me, kapeash? 1. Jason had a dream last night that he was bombing bad guys and he as singing "bombs away, bombs away-ay!" from the Geronimo song. In case you don't know what song I'm talking about, it's at about 1:00 that they sing the part Jason was singing. hahaha he says he was pushing a big red button to send off the bombs. 2. Soooo I deleted what I originally wrote for #2 cause I was being a jerk. Soooo just pretend that number two was a super cool confession. 3. I am leaving to go watch my niece in Iowa in January and I'll be gone for 11 days!!!!!!!!!!!!!!!! That is such a long time to be gone and NOT work on signs. I'm excited cause I haven't met my niece yet (she was born a few months ago) but I'm scared because I literally work on signs everyday of my life so it will be so weird to not do so and to try to communicate with Jason at home (aka he is going to help fulfill orders while I'm gone.) Everyone tell me it will be ok, k?! 4. One time a brand emailed me and asked me to write about socks. And I accepted it. And then I got some sense knocked into me (because I don't even wear socks!) so I declined. The end. Have such a good time with your niece--it will definitely ALL be ok!! I seriously dislike know-it-all people who think/act like they are better than everyone. I was friends with someone like that and got so tired of hearing how her way was the right way (and her subtle put downs of how I was doing things) that I kicked her to the curb. Good riddance. I hope you dont have to deal with that person in the booth too much! Good luck this weekend--I hope you sell out!! ahh thank you!! I hope so, I keep going back and forth from freaking out haha Luckily I don't have to deal with that lady very often but I totally felt bad about even posting something mean about someone so I just deleted that part. I won't know how we did until we get the tags back from the people who ran the boutique but I hope we did well! Thank you! BAAAAAAAAAAAAAAARCA!!!!! How awesome, I play in soccer leagues too, CRAZY fun but a tad bit expensive. It's funny when people try to tell you HOW it's supposed to be when you're not asking. But hey, that's how people live there life right?!?!? I dealt with someone who liked to stir up drama just because she had a boring life, can you guess if we are friends anymore ;)! Your boutique looks fabulous, I know you are going to do amazingly well! haha he lovessss Barca!!! Yeah I see you play on lots of teams, Jason would love if I did something like that! haha oh man I totally felt so bad writing something rude about someone on here so I just deleted that part but I guess I will just have to get over it!! ok i literally laughed SO loudly at the socks thing!!! And then again when I realized that you're looking down at the stripes and the soccer logo like "what is my life" hahahhaha LOVE this post!!! happy friday! hahah thank you!! 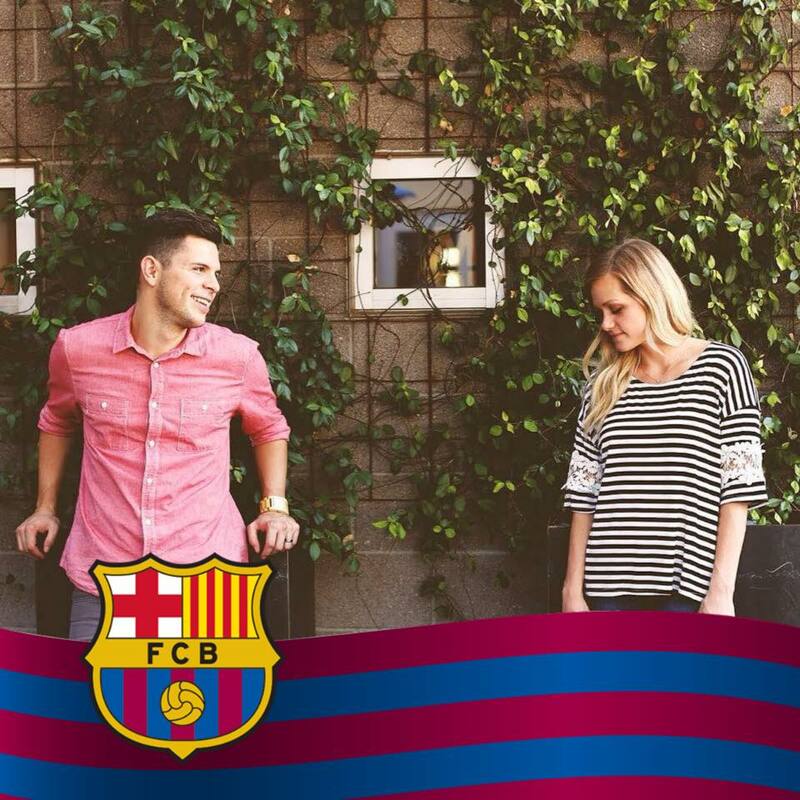 I just thought it was so funny he picked that picture to add the Barca logo to :) He's my favorite! Have a great week! Awww you will have so much fun with your niece and everything will be okay!! Hahaha the Barca logo on the picture cracks me up. Michael loooves Chelsea (in the English Premier League) so he will seriously wake up at like 5 a.m. on a Sunday to watch them (since there is the big time difference). I think he's insane!!! Thank you!! I just keep trying to plan everything around going and getting everything all done! Oh man I bet Jason and Michael would get along great! He loves Chelsea, too!! Jason does the same thing!! Not so much anymore but he used to wake up to watch games haha boys are so funny! Your table looks so pretty!!!! Best sales wishes!!!! Have fun in Iowa! Nieces and nephews are so fun. Happy Friday! Thank you soooo much Nadine!!! At least the background on all of his electronic devices isn't some stupid star wars things (ahem...not naming names) and (insert name not mentioned) is probably more excited to see star wars than was to marry me. Hahah dramatic, but you get the idea. hahaha Jason wants us to pay $20 PER PERSON to see Star Wars next month. Ask me how excited I am to spend $40 on a movie I will literally fall asleep in??!!?!?!? 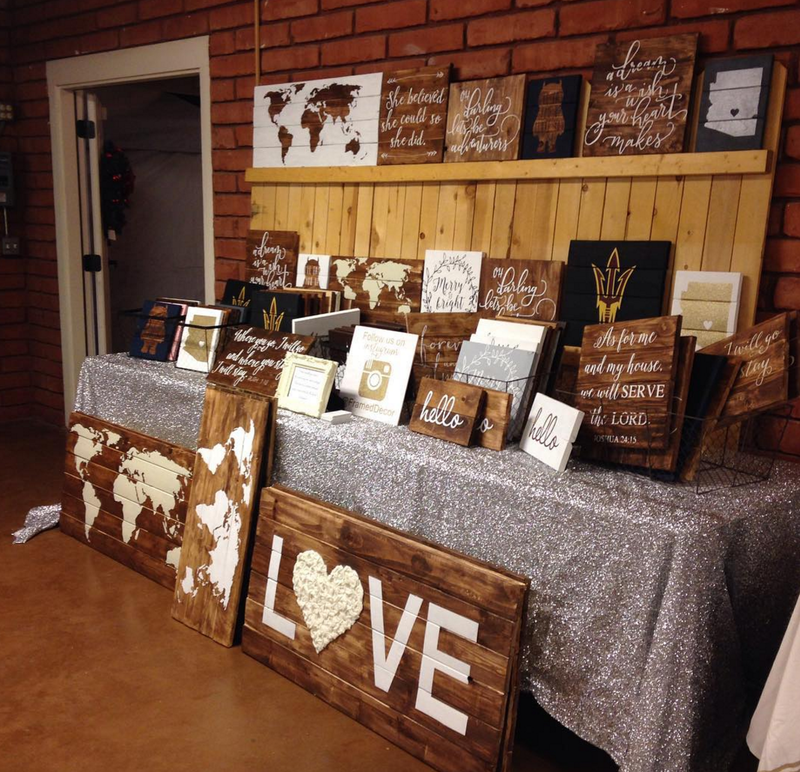 Love your boutique setup! So exciting that you get to go meet/take care of your niece! And Jason will definitely be fine! Thank you, Alana!! I am so excited to meet her and play mama for 11 days! I just have to get everything with our business taken care of and I will be stress free! The setup is amazing! I want everything! haha. haha awh thank you Jen!! Ahh I hope all your signs get sold girl, I don't see how they wouldn't I love them all and if I had all the monies, I would buy them all! You can get baby practice in while you watch your niece ;)! My fiance loves soccer too and has slowly started to play too. His team is Man U though :)! Thank you!!! You are seriously so nice :) Yes I am totally planning on it being mama practice/ training haha Our husbands (aka your almost husband) would get along so well!! Give Jason a soccer ball and a soccer friend and he is the happiest boy ever! Yay for boutiques!!!! Your set-up rocks almost as much as your signs rock. Wah, I want nieces and nephews to love on! Good luck!!! I love your set-up that tablecloth is amazing.. there's no way that someone walking by wouldn't stop! Thank you!! Ahh I hope it all went well! We won't know for sure till we get our tags back, fingers crossed! Best of luck with your boutique. I'm sure you will do great. Also, it is so great that you are taking time off to watch your niece. That is so sweet of you! Awh thank you, Leslie!! :) I am excited to meet/take care of her. Some good mama training before we have our own kids, too! I'm soo nosy so I'm so interested in who you're talking about in number 2. Although your booth is beautiful. Also, congratulations on being an aunt! I 'm sure you've said something about it recently but I can't remember because I seem to be forgetting everything lately. And I bet your niece is the most adorable girl ever. haha I actually felt so bad so I deleted what I wrote for #2!! I shouldn't have talked negatively about someone on my blog, blogger fail!! Thank you though!! haha Jason likes that picture :) I think I have like 20 nieces and nephews!! It's so fun to see all of them grow and gain their funny personalities. I'm so excited to meet my new niece soon! Good luck with your boutique!! Love all your signs and fingers crossed you sell out! Thank you so mych, Emily!! We will know how we did as soon as we get our tags back, I can't wait! I'm sure your trip to Iowa will be great! I can imagine the withdrawal you will be feeling though! Is there any part of the business that you can take with you to work on while there? Thank you!! I am excited, I just have to get the details all figured out with the sign business. I WISH I could take some with me, most of it is so huge that I would have to take like 5 suitcases with me so I am just leaving it all at home. Send good vibes!! hahaah well thank you ;) I don't know why I thought I could blog about socks!! I was crazy! I love that Jason was singing in his dream. Awesome! Also, I'm super curious about #2 now!